Caulacanthus is a densely tufted, dark purple to brown, profusely and irregularly branched alga with a horn-like appearance at branch tips. It does not generally grow longer than 30 mm and is attached to substrata via creeping stolons. 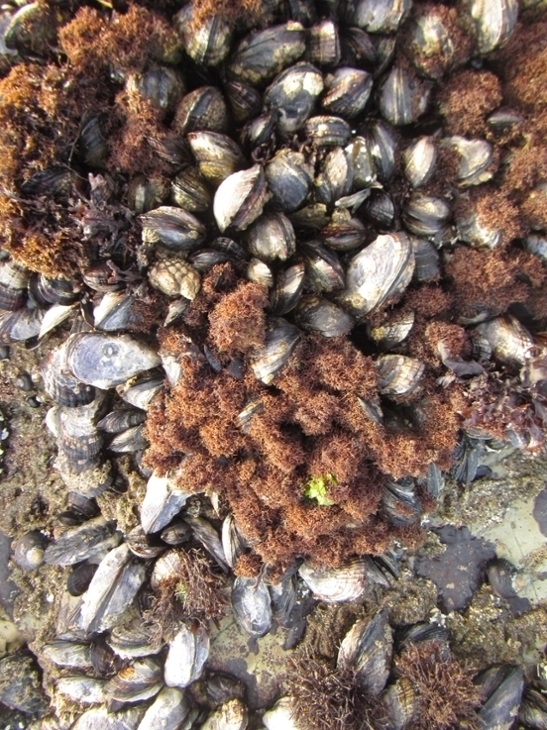 Caulacanthus is found in the upper to mid intertidal zone often growing in and amongst barnacles, mixed in with mid intertidal red algal turf, as well as epiphytic on mussels and fucoids. It generally grows in warm temperate and tropical waters (Rueness and Rueness, 2000). This species is found in various places around the world including several locations along the California coastline where it is especially common in the intertidal zone of southern California (Whiteside et al., 2007). Caulacanthus is very similar and can be confused with the red turf alga, Endocladia muricata, however, it is usually smaller, redder in color, and softer feeling. Caulacanthus was introduced from Asia and first discovered in southern California in 1999. Although Caulacanthus is a non-native invasive species that has been shown to displace some invertebrates (such as barnacles, limpets, and periwinkle snails), in the high intertidal zone specifically, it facilitates a more diverse suite of other animals and algae (Smith et al., 2014). This could be because of the formation of novel turf habitat in the upper intertidal zone where turf algae is not usually found. Algal turfs such as Caulacanthus have been shown to increase habitat complexity, trap sediment, and decrease desiccation during low tide; this could benefit some animals and seaweeds by providing food, habitat, and/or refuge from becoming dried out (Smith et al., 2014).